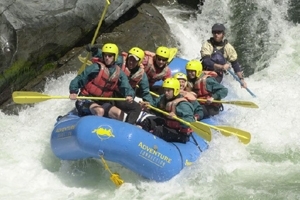 The highest mountains in the world are drained by one of the most amazing river systems giving rise to a vast array of white water rafting and kayaking possibilities. From gentle floats to playful rapids to raging torrents that threaten to pulverize everything in their paths are symptomatic of the watershed of the Himalaya. In Nepal, take a day trip down either the Sunkosi, Bhote Kosi or the Trishuli, all of which offer portions with playful rapids suitable for first timers and families or come with us on multi-day trips on the Sunkosi, Seti, Trishuli, Narayani or Marsyangdi. For the true river rat we offer multi-day expeditions style trips down the Sunkosi and the Karnali two of the finest white water rivers in the world. In Tibet raft with us on portions of the Yarlung Tsangpo which rises in north-west Tibet and flows east through the south Tibet valley before making a sharp turn into India and flowing through Assam as the Brahmaputra (The Son of Brahma) and then Bangladesh to empty into the Bay of Bengal as the Padma. The Yarlung Tsangpo has never been completely run and remains among the holy grail of all rafters and kayakers. However portions of this river in Tibet can be run for short periods. In Bhutan, we’ll take you on either day trips or multi-day trips which are largely wilderness experiences lasting up to a week. The Teesta river valley in the Indian state of Sikkim provides amazing white water opportunities for both the novice as well as the avid enthusiast. Join us on a single day trip or a multi-day adventure filled, adrenaline pumping experience. Or come with us on an adventure of a life time to raft the Zanskar River in Ladhak.